The Ferplast Micky / Milos Large cage is made from solid metal wire with a plastic base, and is suitable for mice and hamsters. It comes complete with all the accessories you need to get started, including a shelf, ladder, wheel, nest and transparent tubes. It comes with a high base to prevent litter spilling out the cage, and is easy to take apart to clean. Please be aware, the RSPCA recommend the minimum size a permenant cage for a Syrian hamster should be is 75cm x 40cm x 40cm. Smaller cages are only suitable for temporary homes. 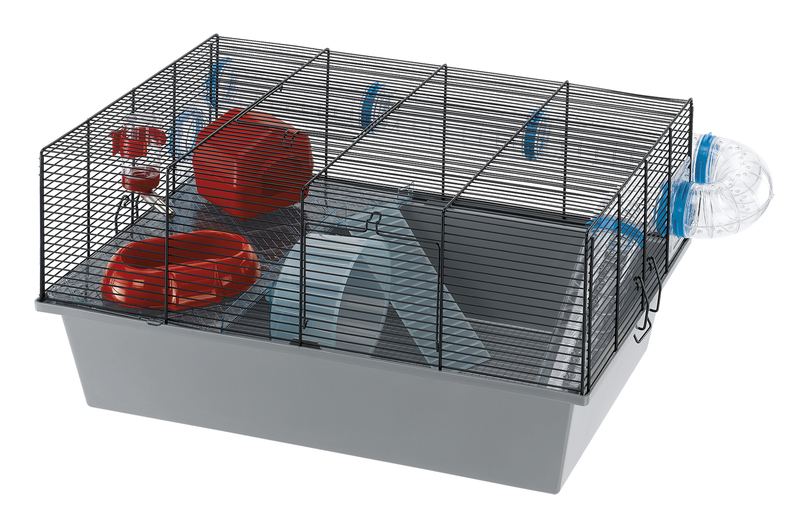 For a permanent home suitable for a Syrian hamster, have a look at the Imac Criceti 16 Hamster Cage. There are currently no questions for Ferplast Micky Large Mouse & Hamster Cage - be the first to ask one!